SD6865 4045. 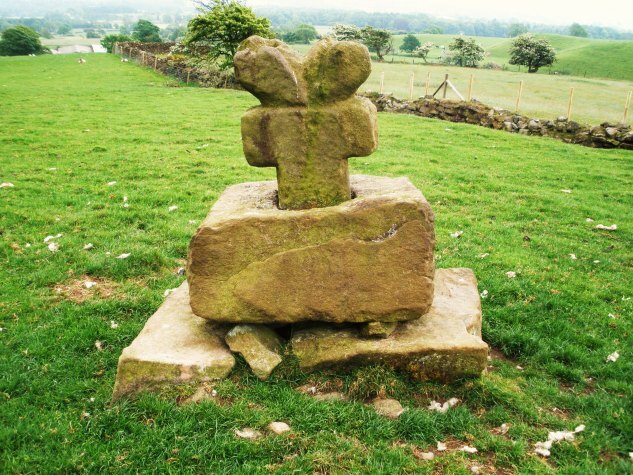 The Kemple End Cross, also known as the Paulinus Cross, stands in the corner of a field beside a wooded area close to Birdy Brow Lane, just up from the Hodder bridge at Bashall Eaves, on the side of Longridge Fell. The town of Clitheroe is 3 miles to the west. A footpath at the northern side of the wooded area heads south-east at Fell Side farm. At first glance the cross looks like a pile of stones but, it is in fact, a pre-Conquest cross dating back to the 7th century AD. It is an odd-shaped cross with a crude and stubby cross-head on a short shaft that is set into a large, natural socketed base-stone that is not the original, that having vanished long ago to where no one knows. All in all the cross and base are 5 foot high. The cross has weathered over the centuries to what it looks like today. Legend records that St Paulinus, bishop of York, preached here in the 7th century AD during his long mission in the north of England between 619-633 AD when he apparently converted thousands to the Christian faith from Cumbria right across Lancashire, Yorkshire and to Lincolnshire. But nowadays sheep and cattle use it as a rubbing post! He is famous for baptising King Edwin of Northumbria into the Christian faith at York in 627 AD. St Paulinus died at Rochester, Kent, in 644 AD. At short distance to the east along a path that leads to a gate there is a standing stone that is pointed at the top and has a large hole near the middle. Could this have been a marker stone for pilgrims visiting the ancient cross, or could it have been used as a gate-post? The stone is much more recent in date. Categories: Ancient Crosses, The Kemple End Cross | Tags: Ancient Crosses, Kemple End Cross at Bashall Eaves in Lancashire | Permalink.